We’d love your help. Let us know what’s wrong with this preview of 1000 Ideas for Creative Reuse by Garth Johnson. 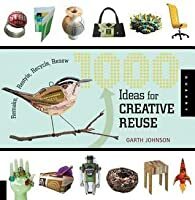 To ask other readers questions about 1000 Ideas for Creative Reuse, please sign up. Minus one star for the poor and confusing set-up of the book - instead of including information (materials used, methods, et cetera) about each project with the photo, said information is confined to a tiny index at the back of the book, making reading up on the projects way more trouble than it's worth. I'm also perplexed as to what guidelines were in place for the "reuse, remake, restyle, recycle, renew" aspect - many pieces were obviously created from brand-new materials purchased explicitly Minus one star for the poor and confusing set-up of the book - instead of including information (materials used, methods, et cetera) about each project with the photo, said information is confined to a tiny index at the back of the book, making reading up on the projects way more trouble than it's worth. I'm also perplexed as to what guidelines were in place for the "reuse, remake, restyle, recycle, renew" aspect - many pieces were obviously created from brand-new materials purchased explicitly for these pieces. This was about a 3.5 rating. There are some very clever and amazing crafty things pictured in the book. but I was stymied by some book layout issues. The premise of this "all photos" book is to present items "remade" from something used for another purpose previously, in some manner remade, restyled, recycled or renewed. The book meets the need of the newish "upcycling" movement. The number "1000" in the book's title is misleading since there are definite repeats, but I guess the author was aimin This was about a 3.5 rating. There are some very clever and amazing crafty things pictured in the book. but I was stymied by some book layout issues. The number "1000" in the book's title is misleading since there are definite repeats, but I guess the author was aiming for a round number. I was most interested in the "Paper, Collage + Assemblage" chapter and the "Jewelry + Adornments" chapters, both of which provided some great creative inspiration and ideas. The soft goods chapter, which you'd think I'd like as a knitter, was mostly sewing items which I didn't think were very appealing--most were a bit weird for my tastes. Jeff and I thoroughly enjoyed looking together at the all-too-short "Geek Craft + Man Craft" section which includes all variety of things made from cogs, wheels, computer parts, etc--including a functional wood computer keyboard with keys made out of scrabble letters, and a keyboard made from old, round manual typewriter keys, lending it a steampunk look. The book ends with a chapter on fine art and installations made from recycled materials, which appropriately rounds off the book with some even wilder inspirations, including woven sapling vessels encircling a building (reminiscent of the woven sapling house in the movie Where the Wild Things Are). The biggest drawback to the book is that the photos are only labeled with the artists' names and country plus the photo credit. I had to constantly skip back to the appendix where the title and materials for the piece were listed. What the beautiful or weird items were remade from is what this book is all about, and why make the reader work so hard to discover what materials the artist used? Generally, I love Quarry books, as they usually always represent the utmost quality in both content as well as design and layout, and are printed on gorgeous, glossy paper. This is my first time reading a volume of their "1000 [Something]" series; moreover, this is the first time I have read one of their books in electronic format (ebook on Hoopla as opposed to Kindle). So right up front, I have to confess that I believe the bulk of my complaints are related to the fact that I was not reading a Generally, I love Quarry books, as they usually always represent the utmost quality in both content as well as design and layout, and are printed on gorgeous, glossy paper. This is my first time reading a volume of their "1000 [Something]" series; moreover, this is the first time I have read one of their books in electronic format (ebook on Hoopla as opposed to Kindle). So right up front, I have to confess that I believe the bulk of my complaints are related to the fact that I was not reading a print copy. I also have no idea if some of the shortcomings I describe are simply restrictions of the medium, or if they could be improved, and whether that would be the responsibility of Quary (the publisher), or of Hoopla. Therefore please take this review with these particular technical constraints in mind. My most major complaint – and now I fear it is relevant to all Quarry "1000 [Something]" books but am not sure – is that detailed information about each artwork is in an entirely separate section of the book from its photo. The pictures of the artworks fill the main part of the book, with just a number underneath, followed by the artist's name with their country, company if applicable, and photo credit where one is needed. So, to see what any item is made of – or even is – requires paging to the back of the book. It's a pain, especially on Hoopla. And the images are WAY too small. I can barely see any details in them. Finally, there are lots of multiple items by the same artist – for instance, there might be ten different aprons by the same person, all in the exact same style. If a call really went out for submissions, one would think the curator would have gotten plenty to spread the joy around a little more. There is so. much. repetition. And there's a lot of repetition, too. Oh, and one more thing that I had planned to leave out, since the poor design of the book is not the fault of the contributing artists, but I feel like it just needs to be said. Most of the items in this book are either impractical if not utterly useless, and I'm afraid that a good proportion of them are just outright ugly. 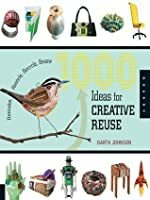 I'm a big upcycling fan and expected this book to be chuck filled with was to reuse items. Instead I found it was just full of pictures of things people have made with no description as to how just the pictures of the item and the name of the creator. I cannot imagine a practical use for owning this book. I think the person who complied this book was a little too focused of quantity and not focused enough on quality. 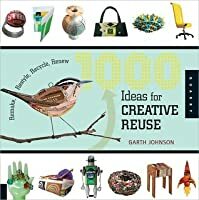 Hey, you know the point of making a book of "ideas" for creative reuse? Actually including the ideas. How about when you put pictures of 1000 different upcycled projects, you actually tell us what is being upcycled, rather than making us flip continuously back and forth to an appendix? Waste of valuable reading time. Fun to look at, but really you could get the same effect browsing through Etsy. In fact, a lot of the artists in this book are on Etsy. I did really like the "Art" section that showed some interesting stuff. Picked up this gorgeous, inspiring art book at the public library sale for just $1. Pretty fitting, I think. This is actually just a book of photographs of projects. Some of them are very, very cool, and there is a directory of contributors in the back in case you really liked something and wanted to try and find it. Some of the artists had Etsy shops. There is also a short list of blogs and websites and another list for recycle centers for alternative art materials. Hopefully, if you like one of the projects enough you can either figure out where to buy it or make it yourself. Fascinating look at artists doing upcycling projects, this book gives plenty of inspiration - I could get lost in it. Unfortunately, it gives less information about the projects and their materials, or about the artists. I still think it's great. Creative projects - yes. Any of them useful or worthwhile or beautiful - extremely few! Not at all what I was expecting. An exercise in creativity for the makers of these things but the book was nothing more than a vanity project - not worth my time. This book caught my eye because of the interesting cover. Also, I'm a big fan of browsing on sites like Etsy.com to see creative ways that people have reused everyday items. -Paper, Collage, &a This book caught my eye because of the interesting cover. Also, I'm a big fan of browsing on sites like Etsy.com to see creative ways that people have reused everyday items. DNF at 50% when it was obvious the last 50% wasn't going to be any more interesting than the first 50%. This could have been so much more interesting, but basically it's like a Pinterest account run amok. It's badly organized. Lots of photos, but not useful information on the materials, methods, or artists. As for ideas for crafters, it's really a lot of stuff one doesn't want made into other stuff that no one else wants. Fine for an art exhibit, but it's all mostly stuff that's going to sit aro DNF at 50% when it was obvious the last 50% wasn't going to be any more interesting than the first 50%. It's badly organized. Lots of photos, but not useful information on the materials, methods, or artists. As for ideas for crafters, it's really a lot of stuff one doesn't want made into other stuff that no one else wants. Fine for an art exhibit, but it's all mostly stuff that's going to sit around and collect dust. I'm all for recycling and upcycling, but the point should be to make something that is useful in its own right rather than to just bragging rights about not throwing something out. A) I read 25% or more. It's a completely arbitrary limit, but that is more than enough time for a book to prove its value to me. B) I find the content or writing especially inane, insufferable, or just plain old dull. This is NOT a how-to book, so you need some knowledge of materials and methods if you want to make any of the projects shown, or refer to instructions elsewhere. That said, this book is simply amazing. It ranges from simple coasters made of album covers to elaborate art pieces requiring metalworking skills and everything in between. It features sections on paper crafting, couture and soft goods, jewelry and adornments, geek craft and "man craft" (??? ), housewares and furnishings, and art and ins This is NOT a how-to book, so you need some knowledge of materials and methods if you want to make any of the projects shown, or refer to instructions elsewhere. That said, this book is simply amazing. It ranges from simple coasters made of album covers to elaborate art pieces requiring metalworking skills and everything in between. It features sections on paper crafting, couture and soft goods, jewelry and adornments, geek craft and "man craft" (??? ), housewares and furnishings, and art and installations. Plenty of ideas as described in the title (though not exactly 1000 since there are similar items that are duplicates). While the projects certainly involved DIY for the maker, don't expect this to be a DIY book with instructions or material listings. This is purely a "look book" of sorts for inspiration. Good for people who might like the look at DIY, but not necessarily interested in doing it themselves (each photo does list the maker, and their company), or for those already who have some DIY Plenty of ideas as described in the title (though not exactly 1000 since there are similar items that are duplicates). I picked this book up from the library (alright I made the order it and then picked it up) and I really liked it! Most "recycling other stuff for crafts" books give detailed instructions on how the project can be redone. I don't always like that because it takes away from the creative process. This book has relatively no words in it at all. Page after page of images with the artist's name and country equals 1000 IDEAS, not 1000 projects you should copy. Bravo. I was very disappointed with this book! The title was exactly what the book was... ideas for creative reuse... but unfortunately there were no descriptions on materials or methods used! This pic is just 1000 pictures of (albeit fantastic)"Creative reuse" I would reccomend this to experienced mixed media artists and craftsters, but not to anyone who wants to learn how to actually do this type of art. What great book! So artistically amazing - I got so many great ideas from it. I would definitely recommend it to people who love arts & crafts.The book contains only photos, no craft instructions. It is more like an arts & crafts exhibit showing creative works from artists all over the world. Just to give you an idea: Necklace made from cards, barbie parts (face/lips) necklaces, table cloth made of Splenda packages, handbags made out of zippers...You get the idea - it's really epic! Beautiful art as well as useful items made by repurposing items. Many many artists are respresented in this book. It was fun to look through and see how really creative people can be. Very inspiring book. Makes me want to look at things a bit differently. A wonderful resource for artists or those who just want to be inspired and amazed. I picked this book out from the library by the title. I was hoping for more every day type reuse ideas. This book is geared to artists and has cutting edge type crafts. The format is different with all the pictures in the front and descriptions for each picture in the back. Unless your looking for a catalog, I don't recommend this. This is not an art instruction book. It's browsing pictures of things people made including where you can shop for tier items. This was really fun to look at. It wasn't quite what I expected though--I thought I was getting a book of projects ideas with instructions and materials lists. Nevertheless, there are some really really cool ideas in here that I'm going to have to keep in mind. Not particularly well-curated selection of the thousands (maybe millions at this point) of of images of this kind you can see on etsy or pinterest. Don't bother unless you want a coffee table book for an extremely uninspired friend.